Pony Club recognizes that equestrian headgear that does not meet the ASTM Standard (#F1163-88-SEI) is not safe, although certain equestrian activities pictured in this blog may not adhere to these requirements. 1. What kind of horse-related background do you have? I personally never rode (except some trail rides with friends and hopping on a backyard pony when I was young.) 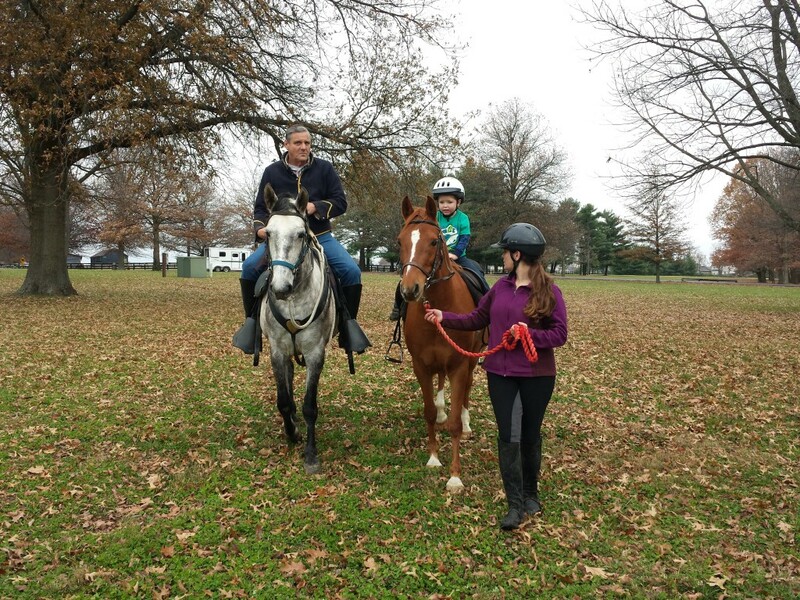 My daughter had friends in elementary school who had horses and Lindy started taking lessons from Mary Ann Andres, the DC of Sunnyside PC way back in 1992. We had a friend who owned an American Saddlebred gelding and he needed someone to ride the horse in competition so Lindy began riding a 3 year old 3-gaited horse and they earned enough points to compete in the World Championship in 1996. They didn’t win – but it was an honor to be in the ring with those riders. I remember one time being at a show in Lawrenceburg, KY and standing in a box watching the class and looking over and thinking “That’s Captain Kirk!! !” Yes, it was William Shatner. Now we own 6 horses and board 2 others so the pasture is full. Lindy, and her dad Bennie, now ride in the largest Civil War Cavalry unit in the country – the 6th Ohio Volunteer Cavalry. Lindy says this is the hardest she has ever ridden – a typical battle scenario can last 45 minutes or more with constant attacks and retreats. 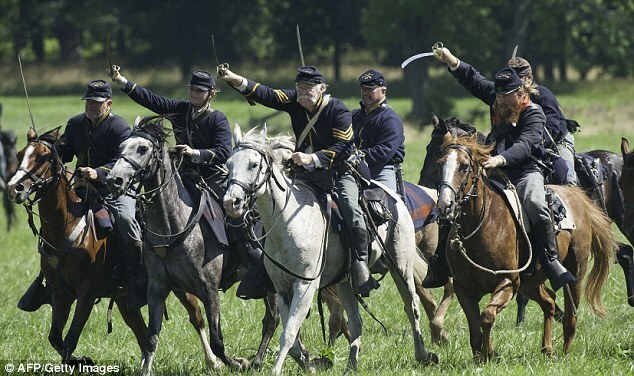 The pictures I included are of the 150th Battle of Gettysburg reenactment. Lindy is on the steel gray mare – Stella. Me – I’m one of the camp cooks. We feed upwards of 75 people at a national reenactment and this is by preparing the food over an open fire. One of our horses is a 10 year old Arab gelding who is destined to be the next Pony Club pony for my grandson Knox. 2. What made you want your child/children to join Pony Club? Once Lindy started taking lessons from Mary Ann, I saw how she gained confidence and knowledge. The USPC program seemed to have everything she needed to learn how to take care of horses and manage their care. Lindy’s first pony was a nice little gelding and I remember her first rating (she went from UR to D3 at one time) was with the famous Joy Bennett from Covered Bridge Pony Club. We then progressed to an OTTB that was purchased from the killer’s paddock at a local auction and we paid for him by his weight. Aerial (racing name Majesty’s Kingdom) took her through her C3 rating and still lives very happily out in the paddock and is quite content at age 26. Lindy took her C3 tests back in the early 2000s. Yes – I said tests. It took her 3 tries to pass. This was back in the day when everything was done at one testing – the HM knowledge and all the riding phases. The first attempt she completed an ACL tear when she knelt down to apply the wraps and didn’t say anything to anyone but didn’t pass because she had a “weak leg”. The second attempt was tragic – the night before our Friesian mare fell into a cistern on the property and all the horses were very upset. The mare did not survive, and all the first responders left the property about 3am but Lindy decided to try to go to the testing anyway. The horse she took was Aerial and he was also still very skittish after the events of the night so it wasn’t a good test. This was also in the day when parents weren’t allowed anywhere near the candidates and could only watch from afar. The third attempt was wonderful. The examiners were kind and allowed the parents to assist with feeding and grazing the horses as needed and that support was so much better for all the candidates. It proved to me that the personality of the examiners is just as important as the horse and rider. This is why I get so discouraged when young people these days say they are going to quit USPC if they don’t pass their upper level exams the first time. If you want it bad enough – you have to work for it. 3. In your opinion, what is the best thing your child/children has/have learned from their time as a Pony Club member? My daughter learned how to take responsibility for an animal and all the equipment needed to ride and care for that animal. She can handle all manner of barn situations without hesitation from colic to abscesses. In this, RESPONSIBILITY is the greatest lesson. CONFIDENCE is another lesson well learned. Being able to work out riding strategies in her mind and explain those to a NE could be daunting for some adults, but USPC teaches it’s members how to do that. Confidence in your personal life leads to confidence in your professional life. TEAMWORK is also very, very important. Not too many young people have the opportunity to participate in a team sport that includes the care of large animals – and the emphasis on those animals is as great as the performance on the playing field. The tack room at a rally is a wonderful classroom for 12 hours spent together each day. 4. Do you have a favorite memory of a Pony Club event? I don’t have one specific memory but I like to remember everything from all the rallies and lessons I’ve gone to over the years. Being there when Lindy got her C3 rating is probably the best one since she worked so hard to achieve that status. I also have wonderful memories of the time when an “adopted” Pony Club daughter got her A rating. I’ve been in Horse Management for a long time and just working with the competitors in the barns has brought so much pleasure over the years, and some not so pleasant memories. I have literally watched many Midsouth members grow up and take great pleasure in seeing them every year and catching up with their lives. I started out as a volunteer at the club level, then moved up to the regional level and now am active at the national level. It’s been close to 20 years now and I wouldn’t give it up for anything!